For many years, Barcelona enjoyed a golden image around the globe. But that image has been shattered by a series of negative episodes - of which a transfer ban is just the latest. On Wednesday, Fifa announced that it had banned Barca from signing any players for the next two transfer windows. It was another significant blow to the club's global reputation. It didn't used to be like this. Barca's 'More Than A Club' motto suggested a club morally superior to their rivals, who turned down big corporate deals to emblazon Unicef's logo across their shirts while entertaining the world with an attacking style of play led by whiter-than-white superstar Lionel Messi and his fellow academy graduates. 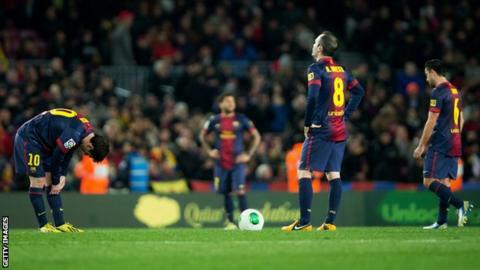 Barca's fall from grace can be traced back to December 2012. That was when then-manager Tito Vilanova was diagnosed with cancer. Although the news was greeted with nothing but sympathy, it indirectly led to a bitter fall-out between club president Sandro Rosell and former boss Pep Guardiola. Despite the unwelcome off field distractions, Neymar and Messi have 44 goals between them this season. Vilanova spent two months receiving treatment in New York, where Guardiola was living during a one-year break from the game, having left the Nou Camp that summer. Rosell criticised Guardiola for not visiting Vilanova more often. That brought an angry response. "Too many things have happened that have crossed the line," Guardiola said. "I will never forget they used Tito's illness to cause me damage." Further trouble lay ahead for Rosell. At the end of last season, Barca allowed Eric Abidal to leave - and the popular defender made clear it had not been his decision. The 33-year-old had only just returned to action after a liver transplant, having fought cancer. Many fans felt the club had gone back on a pledge to keep the former France international and jeered Rosell during Abidal's farewell ceremony on the final day of the season. Shortly before Abidal's departure, Barcelona confirmed that their shirt would carry a commercial logo for the first time in the club's history, following an agreement with Qatar Airways, worth at least £25m per year. Many fans felt the deal had come about by stealth following a two-year 'transitional' period when the shirts bore the logo of the Qatar Foundation charity. The result was further damage to the club's reputation and Rosell's standing. Then in June last year, Messi was accused by Spanish authorities of tax evasion. The Argentine star and his father Jorge were ordered to appear in court in the seaside town of Gava, just outside Barcelona, and they also made a payment of 5m euros (£4.14m) in back taxes which - for now - appears to have prevented further punishment. All of those affairs were small fry, however, compared to the scandal unleashed by last summer's signing of Brazilian starlet Neymar from Santos in a deal worth 57.1m euros(£47.3m) - or 86.1m euros (£71.3m), according to the tax authorities - who have argued that Barca deliberately under-declared the true value of the deal in an elaborate tax dodge. Amazingly, the matter was brought to the attention of the Spanish courts by one of the club's own members, a pharmacist named Jordi Cases, who wanted to use the case to oust the increasingly unpopular Rosell. Barcelona's loyal fans will have no new faces to cheer on for the next 14 months. Cases succeeded in that aim. Rosell resigned in January as a direct result of the controversy unleashed by Neymar's contract and handed over the reins to his former right-hand man, Josep Maria Bartomeu. After a torrid first few weeks in charge, long-serving board member and former engineer Bartomeu, 51, seemed to be heading for calmer waters. Until Wednesday, his focus was squarely fixed upon this weekend's upcoming referendum of club members, who will be voting on whether to approve the board's plans to renovate the Nou Camp. Shortly before Rosell departed, he announced plans to invest 600m euros on a major building project which would increase the stadium's capacity to 105,000 and provide a significant upgrade to hospitality facilities, as well as incorporating a new 12,000-capacity indoor arena for the club's successful basketball team. Pushing those plans through for approval by the members had been Bartomeu's number one priority but now, to provide the sickly icing on Barca's unpalatable cake, they have been found guilty of breaking Fifa regulations on signing players under the age of 18 - hardly an ideal scenario for a club which prides itself upon its youth development system. With justification, Barca will feel hard done by. It's unlikely they are the only club to have bent the rules on Fifa's transfer regulations and Barca will also recognise bitter irony in their punishment after seeing a number of their most talented young players 'poached' by big-spending English Premier League clubs - with Josimar Quintero (Chelsea), Julio Pleguezuelo (Arsenal) and Sergi Canos (Liverpool) recent examples. In Barca's defence, it's certainly fair to suggest that they are nowhere near as reprehensible an organisation as they are currently being portrayed in some quarters - a point made by Spain's Sports Minister Miguel Cardenal in a recent open letter defending the club. Madrid-based sections of the Spanish press appear particularly quick to denounce the club's actions regarding Neymar's contract, and are sure to leap on this latest opportunity to dish out criticism. But the early reaction of the fans to this latest news seems to be a case of "enough is enough". And at Barcelona, which is owned by its 160,000 members, the opinion of supporters genuinely matters. Whether he deserves it or not, Bartomeu is likely to be cast as the villain. His days as president could already be numbered. But if he goes, will it be enough to restore the club's cherished but tarnished reputation?